The back rest is an important part of any type of chair; it provides support for the upper body and relieves weight from the lower back. Ergonomic seating is not equipped with a standard back rest; this important piece is tensioned so it can recline when a certain amount of force is applied. The tension can be adjusted to accommodate a user’s weight so when the user leans back, the back rest reclines with the applied weight. Being able to adjust a back rest’s tension is important so a user can fine tune the weight required to recline the back rest. Without this feature, a back rest could be too soft to support a user’s weight or too hard to recline for light-weight purchasers. A tensioned back rest is like a shock absorber for the back and offers several advantages. When a user sits suddenly, upper body force is absorbed by the back rest, reducing the impact on a user’s body. It offers various body positions; if used to recline or stretch, a tensioned back rest can handle that movement. 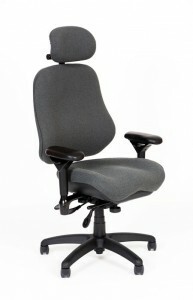 Having an adjustable seat is another important ergonomic feature that provides an appropriate height in relation to other components like a desk or computer monitor, which is necessary because individual body proportions vary. For example, two people of similar height won’t necessary share the same seat height adjustment as one may have a longer body and shorter legs, while the other may have a shorter body and longer legs. Depending on design, seat height can be adjusted via a lever on the side. With these chairs, the adjustable seat has a shock absorbing capability. When a user suddenly sits down, a spring will absorb the sudden impact, thus reducing pressure around the buttocks and back. The arm rest is designed to provide additional support to the upper body by holding the arm weight. This ergonomic feature is ideal for users who operate a computer as it reduces the effort needed to support the arms in order to reach a mouse or keyboard. The arm rest must adjust to accommodate different user’s arm lengths. Having an arm rest that is too low causes leaning down to reach the arm rest, while having one that is too high or wide can add stress to the shoulders. A properly adjusted armrest should be wide enough for easy entry and exit, close enough to provide arm support, and high enough to maintain proper posture. 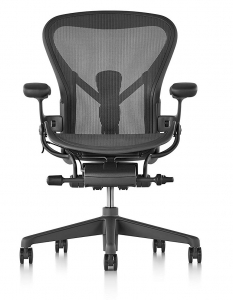 The last component of an ergonomic chair is the base. Ideally, ergonomic seating must have a stable leg base to provide support for remainder of the seat. Anything with less than five legs is known to be prone to tipping, thus reducing safety when used. A base must also be equipped with castors to make any movement easy. Ergonomic seating is composed of four major components including a tension back rest, adjustable seat, supportive armrests, and a sturdy base with castors. Those who have chronic pain or spend a great deal of time at a desk chair may want to see the difference an ergonomic chair can make on quality of life. Most users say it is worth the extra cost! 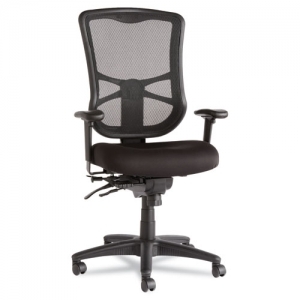 The Ergonomic Chairs Store Has the Best Quality Ergonomics Chairs for You! Have you experienced the difference ergonomic chairs can make on your daily life? 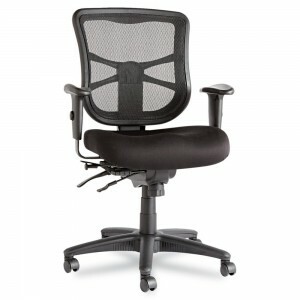 Contact the Ergonomic Chairs Store to learn more about the benefits of a perfectly designed office chair!